When you go to New York City, Chicago, Boston, Washington D.C. or even Minneapolis you almost expect to see a vast array of transportation choices. These big cities have the density to support programs like bike share. They also usually have the staff to dedicate to the program’s success. Smaller cities often do not have the resources to implement these ‘extra’ programs. Many are auto-centric and are just trying to survive. The thought of global competitiveness is often lost to the worry over pension benefits, crumbling infrastructure, and increasing the tax base. Some small to medium sized cities are realizing that there are huge benefits to providing transportation alternatives. 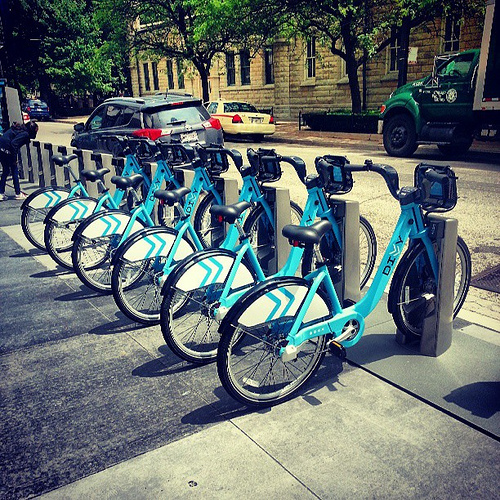 With bike share programs, residents and visitors now have a low(er)-cost option to driving. It’s good for the environment, people are getting a little exercise and there are proven economic benefits. Cities like Madison, WI, Boulder, CO, and Chattanooga, TN have already started their programs. Places like Columbus, Ohio are expected to roll out their program at the end of July. Albany, NY, Providence, RI, and the Sacramento Region have studied the feasibility of bike share and just need that extra financial or political push to get started. It may take some time but bike share programs are catching on and we should expect to see more of them in the future. They don’t replace the automobile; they simply provide an alternative and reduce the physical stress on our roadways. Oh, and they are fun and convenient! Next post: Miami condo building with no parking?